How do I get connected to UFB? Most home wiring installed since the 1970s should be sufficient to deliver UFB. You will have a new External Termination Point (ETP) fitted on the outside of your house, through which the fibre connects to an Optical Network Termination (ONT) point inside. Your RSP can provide more specific advice applicable to your circumstances. There are three stages to receiving services over UFB: the Local Fibre Company (LFC) or Chorus will build distribution fibre down your street, then they will put in a connection ( the service line or “drop” from the street) to your home, school or business; and finally inside your building you’ll have your computer and other devices connected to an Optical Network Termination point (ONT). The UFB initiative is building what is known as the “last mile”, that is the fibre connection from the exchange, or the cabinet, to your door. You will be advised several weeks in advance of when work is starting in your street. The LFC/Chorus will let you know when work will get underway, they’ll tell you when or if you should make alternative parking arrangements and will ensure the work site is safe. If you already have connection above ground, then your UFB connection will also be above ground. 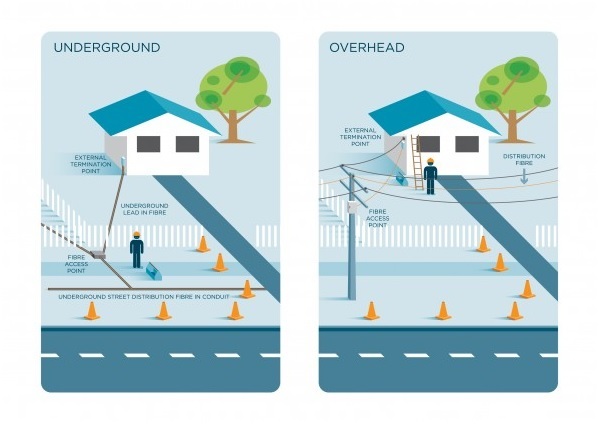 If your connections is currently underground, then your UFB will be connected underground as well. Once the network is in place in your street, you will contact your preferred Retail Service Provider and request a connection. The line will either be strung from a pole or run underground from a fibre access point on the boundary. Whichever way the “drop” is delivered to your building, it will extend to what’s called an External Termination Point (ETP). Just like the current copper service, the ETP is a small box fixed to the outside wall. LFCs/Chorus do not charge your service provider for a standard installation but an up-front charge may apply if your drop is longer than the standard length. You are best to confirm if there’s a cost when you buy a service. You can get set up for fibre when you get the service line. The installer will put a small box called an Optical Network Termination (ONT) point inside the building and connect it to the External Termination Point. Generally, the ONT is located in a central place in the building, near the other devices you’ll want to run over fibre. It needs a power source and you may request a battery backup in the event of an emergency. Indicative only. Individual circumstances may vary. 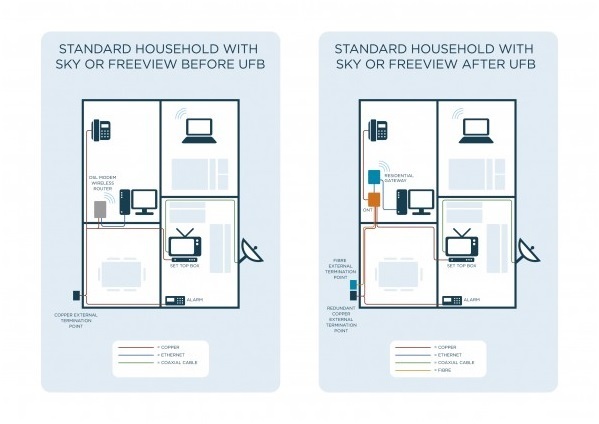 Getting UFB in your apartment, office-block or down a shared driveway. People with shared driveways, who live or rent apartments or are the owners or tenants of offices in multi-storey buildings will need to go through the Land Access Reform process for consents when they do request fibre following completion of the build in their area. The LFC will need to notify your neighbours of this planned work and in some instances, they may need them to give consent before getting the work started. When the LFC receives a request for fibre, they will scope the work and decide which of a number of ways is the best fit for that particular connection.